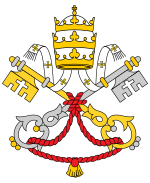 In 1950 Pope Pius XII defined the dogma of the Assumption of Our Lady in body and soul to Heaven. 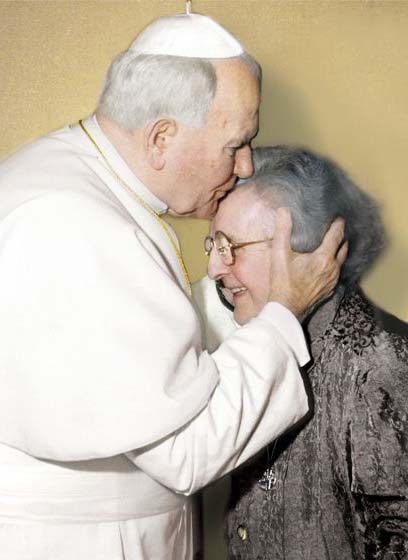 Ten years later –in 1960– like imprinting His seal upon this dogma –as it were– the Lord was pleased to allow Mother Trinidad to live in such bright and full light this mystery for her to contemplate it and tell others about it, or even “sing it,” as she herself says in the bosom of the Church. 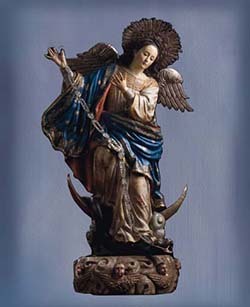 With the strength of her testimony everything is evident: our souls –warped by original sin, something which Mary didn’t experience– delve with a sense of novelty and astonishment into what happens to a creature that is free from the consequences of sin. In this writing it can also be understood the difference between our death –as a result of sin– and Christ’s death –which was necessary for Redemption. Such considerations highlight therefore the Virgin’s role in co-redemption always in unison with the Redemption of Christ, with whom Mary lived His Passion, Death and Resurrection, being not only involved sentimentally, but actually participating in it. […] At the proximity of the glorious day of the Assumption of Our Lady, I wish to manifest what on the 15th of August of the year 1960 my spirit lived, taken by God […] to contemplate in a most profound, most clear, unimaginably amazing way, and lived in a savouring of enjoyment of Eternity, the transcendent, sublime and indescribable moment, full of splendour and majesty, of Our Lady, all Virgin…! all Mother…! and all Queen…! being raised in glorious, most blissful and splendorous Assumption from this earth, in body and soul, to Heaven. 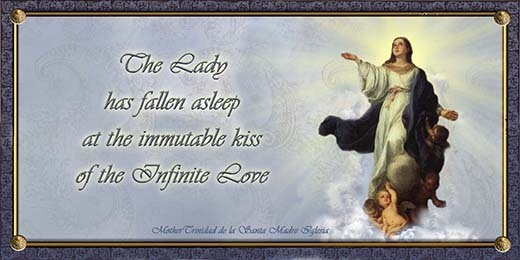 Day of the Assumption of Our Lady…! If Mary could of have been a little bit more divinized, She would have lived longer. God made Mary with an almost infinite capacity for divinization; and when She was saturated and replete, rushing to Her, manifesting Himself in the attribute of the immutability, as lovable Hero, He stole His prey, and rendered Her immutable in the light of Glory. She always was adhered to Her Son; and the posture of Her soul, after the resurrection, was an adherence to this New Man so great, that the Lady was together with Him the New Woman who collaborated –through the mystery of the Incarnation, in the life, death and resurrection of Christ– to bury sin and, with it, the sinful man, crushing the head of the serpent, so that a New Man would rise from the dead, to whom would adhere all the children of God who wanted to engraft themselves on the Tree of Life. The living of the Virgin with Christ in His passion, was a mystical and bloodless death, which made Her rise from the dead also mystically with Christ; going to live, as Mother of the universal Church, the new life that by Christ is given to us all. 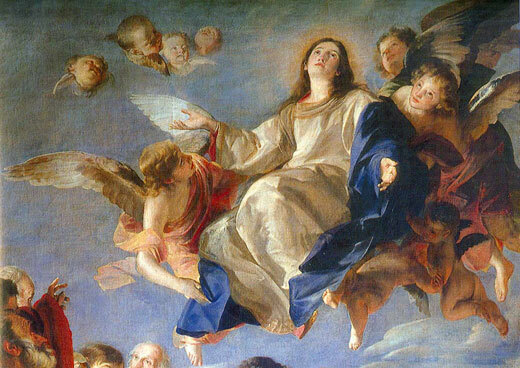 Mary’s soul, always with Her wings stretched out, is the perfect expression of the fulfilment of God’s will over men; therefore, when the exile ended, it takes its body therewith, without having to experience the burden that the latter implies for the totality of mankind.